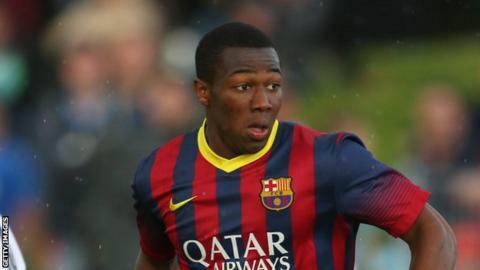 New Aston Villa signing Adama Traore has indicated he wants to commit his international future to Mali. Villa signed the 19-year-old from Barcelona on a five-year deal for a fee reported to be around £7m (US$11m). He has represented Spain at under-16s, under-17s and under-19s levels. The Mali Football Federation confirmed to BBC Sport it has met with Troare who said he wanted to swap national allegiances to his parents' homeland once his club future was secured. His brother Mohamed, who plays for Spanish club Cordoba in their B team, has already played for Mali Under-23s this year. Football's world governing body, Fifa, has told BBC Sport as yet it has received no official request for a change of allegiance.